Customers increasingly prefer the digital channels – mobile, web, IoT – to engage with service providers and vendors. You have to be able to meet and exceed these new expectations. Customers expect you to get your mobile apps right the first time. If not, they move on. Quality is critical, regardless of how fast you are innovating. As demand increases, you need to be more productive and responsive. There is less time to properly define test requirements. New apps and services have to be developed for multiple platforms, devices and operating systems. It’s difficult to incorporate it within tight time frames – especially when applications are brand new to market. Manual testing processes can only cover so many different use case scenarios making for hard decisions about where to spend QA time and resources. You are likely serving an increasingly global customer base with specific local requirements. As a result of all these factors, QA teams have less and less confidence in the quality of releases and companies risk dissatisfied customers and damage to their brands. Companies that depend on getting new applications and digital services to market require a different approach to QA and testing. One that can meet expectations for faster cycle times and higher service levels. Quality Engineering (QE) can help organizations achieve this goal consistently and efficiently. QE – What’s the Big Difference? “Assures” quality in the process and the product. It fixes and prevents mistakes and defects in products or services. It’s more reactive. Standards: Identifying those which are a “value add” to the enterprise and assuring compliance to them. Surveillance: Including reviews, audits, demonstration, inspection, testing, analysis, metrics, etc. “Drives” the development of high quality products or services and the processes that support them – from start to end. It’s more proactive and integrative. Cross-functional Teams: Emphasizing quality from ideation through commercialization. Processes: Defining, supporting and implementing processes such as BDD/TDD, Agile, Kanban, CI, etc. ; leveraging automation wherever appropriate. Re-usable Tools: Building test frameworks to make QA processes more scalable and accelerate DevOps strategies. Application defects can be detectedearlier in the product lifecycle, making them easier, faster and less expensive, to correct. Increased automation can minimize the need for manual intervention, reducing both regression and smoke test cycles and enabling parallel testing. New applications and services get to market faster, increasing customer satisfaction and competitive advantage. Testing resources can be used more efficiently, increasing productivity and reducing total cost of ownership. Not all organizations have the necessary skill sets in house for QE. And they can be difficult to source in the current market because of their value. QE requires some level of culture change within an organization. It’s disruptive, but it’s necessary. And the benefits far outweigh the pains. An effective QE approach requires the right test infrastructure; one capable of accommodating the diverse and constantly changing set of devices, platforms and operating systems being adopted by customers. If your organization is serious about making the shift to QE, Infostretch suggests the following to help make that transition successful. Refocus your QA efforts from testing features and functions to evaluating customer experience and business assurance. Expand your testing teams’ skills beyond manual and test automation to end-to-end quality engineering. Use proven Agile and DevOps practices to transform your organization, break down silos, and accelerate your software development lifecycles (SDLC). Prioritize testing with predictive quality analytics and continuous monitoring and feedback. Make continuous integration and continuous delivery (CI/CD) a key part of your QA strategy; leverage on-demand testing environments. QE requires a tools-driven approach. 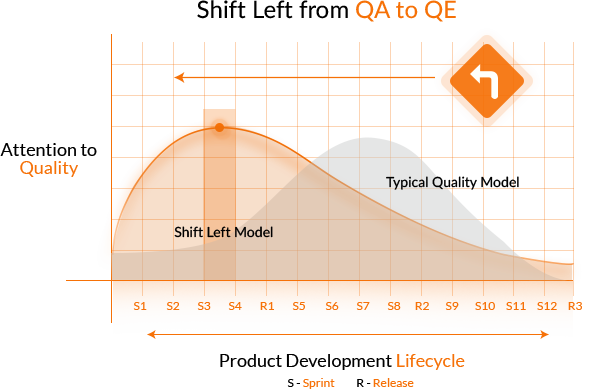 This enables your QA organization to scale to meet the faster cycle times and increasing complexity in your software development lifecycle. There are a number of proven tools on the market to help jump-start your efforts. The chart below is a sampling of some of the best tools (in our view) categorized by their role in the development lifecycle. Increase user engagement and satisfaction by providing their customers with a higher quality user experience. Now is the time to start making the shift in your organization. Infostretch helps enterprises get their digital initiatives to market faster, more efficiently and more flexibly. Whether you’re scaling an existing initiative or launching something entirely new, we help assure quality while reducing operational costs, increasing market coverage and speeding time to market. We have developed proven methodologies, tools and infrastructure to help companies accelerate their adoption of QE. These include best practices in Agile testing, continuous integration and test-driven development and industry-leading products like Jenkins, Selenium, Appium, Perfecto, Sauce Labs and QMetry Automation Studio that help clients improve service quality and speed time to market while reducing their operational costs. We deploy the right blend of resources to complement the existing team and leverage existing tools and resources where appropriate. This ensures optimal impact and ROI.